It is early August 2014. It has been the hottest days in Rovaniemi for the last 50 years. 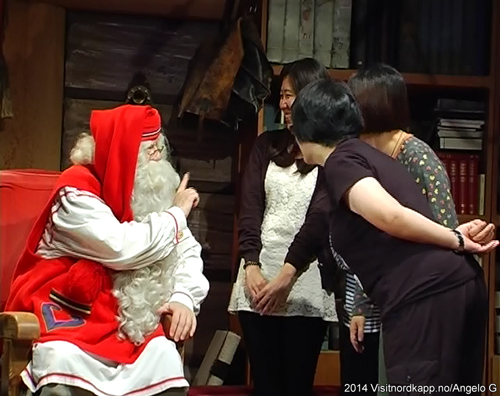 Santa Claus, or Joulupukki in Finnish, has given us a rare opportunity to meet him before office hours. 30 degrees is hot in Rovaniemi. Behind his beard, Joulupukki admits, we use modern technology to stay cool. The air condition is providing Joulupukki with air more along what we all associate him with. Rovaniemi can be a cold place, especially in winter. A hot day in August, but June was the coldest we’ve had in 53 years, he continues. One Midsummer we even had snow. During our talk Joulupukki reveals three secrets: His linguistic proficiency, the year-long preparation, and the gathering of a special group of characters. In another blog post, you will learn other trivial anecdotes about Joulupukki from the Arctic and how it affects people throughout the world. 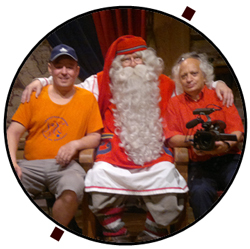 The first time I met Joulupukki in Santa Claus Village, I was mesmerized by his proficiency in all sorts of languages. How can it be? In a busy week, says Joulupukki, I will greet guests from 70 – 80 different countries. People come from Kenya, Canada, Estonia, and Austria to visit. He picks up languages by talking with kids from all over the world. And remember … everybody under the age of 100 years old is a child. If they are older, he considers them teenagers. He receives millions of letters from kids. He doesn’t read them all himself, he has helpers and elfs to help him out. And he is enjoying more than 100 000 guest every year. It is now wonder, he is a linguistic artist, and he is practicing multiple languages every day. The second secret is maybe not as artful as his first secret. Preparations for Christmas starts as early as Boxing Day, says Joulupukki. He and kids all over the world are on the involved in the Christmas event the whole year. Getting wishes both in person and by post, the stack of wishes are getting higher especially between August and the Holiday seasons. In preparation for the big day, Joulupukki and his helpers are manufacturing gifts throughout the year. Every year they are changing the production line a little bit. The kids have different wishes year by year. On December 24th Joulupukki leaves the office earlier than normal, for obvious reasons. He spends most of the time in the air with his reindeer. If you don’t believe Santa Claus comes from the North Calotte, his reindeer surely do. Joulupukki returns later than normal to the office the next day December 25th, guess why! It is quite a job for Joulupukki. He can do a global job in one day because of the time zones. He doesn’t have to be everywhere in one instant. The Christmas miracle, however, isn’t possible if kids all over the world don’t prepare for Christmas. It is a simple task and can be illustrated by the personal message Joulupukki sends to camera man Angelo’s daughter Aisha: … and, remember to be good! Secret number three is like a Christmas version of the Fantastic Four movies. Every now and then Joulupukki meet some of his colleagues in Rovaniemi. There are different types of “Santa Clauses” in different parts of the world: Ded Moroz (Дед Мороз) from Russia, Szent Miklós from Hungary, Sankt Basil from Greece, and Sinterklaas from the Netherlands. All have somewhat similar background and share a common purpose. They all meet to share their experience of spreading joy to kids around Christmas time. 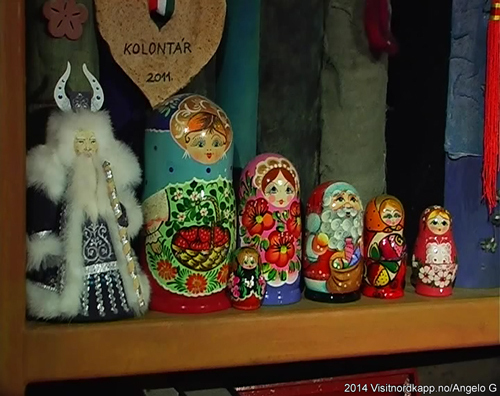 Before we said our goodbyes, Joulupukki shows us some of the gifts he receives from visitors to Santa Claus Village. One gift is a matryoshka doll of Ded Moroz. We’ll meet again at Christmas time.